So, you’re expecting a baby. Congratulations! 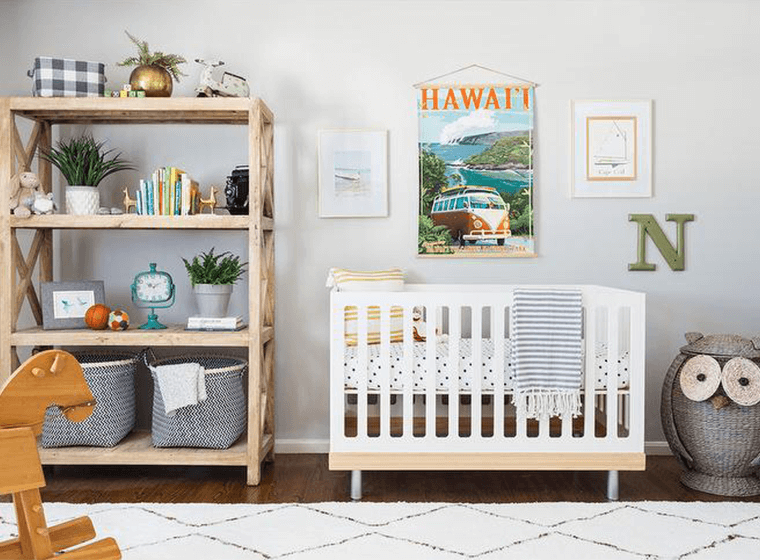 As you start getting ready for your new arrival, you’ll want to think about what kind of nursery you want to create. Nurseries are among the most fun rooms to decorate, since you can really get playful with your designs. However, choosing your nursery colors can seem a bit overwhelming. Don’t worry, we’re here to help! Let’s take a look at some of the things you should consider when choosing your colors. We don’t know exactly how color affects infants, but we know a lot about how older children and adults respond to color. There’s a good chance that babies have similar responses, so it’s important to consider color theory when selecting a color for a nursery. Babies have a whole lot going on! They’re constantly growing and developing, so you want to make sure you keep this in mind. You want something that is both soothing and also stimulating. Brights like red, orange, or yellow should be used sparingly. They’re great as accent colors, as they bring some energy and liveliness to a room, but can be very jarring to a baby if used as the main wall color. Lighter versions of these colors (like a pastel yellow) can work on the walls, but you want to make sure you don’t overdo it. You also want to make sure you stay away from any colors that are too dark. A dark space can definitely change the mood of an adult, so it’s entirely possible that it does the same for babies. Use darker colors as accents and stick to lighter colors on the walls. With that in mind, the next thing to consider is whether you want to go with traditional gendered colors or stick to something more neutral. Pink is probably the most common color for baby girls. In its softer forms, it can be quite soothing to babies. It’s a warm color and makes spaces very cozy and pretty. If you want a similar feel to pink but don’t want to go quite as girly, lavender is a good option. Lavender is a very soothing tone and creates a very calm and serene space. Blue is the classic baby boy hue. It has the soothing vibes of nature, which makes it ideal for use in a nursery. However, the shade makes a big difference. Softer blues are best for allover wall colors, as darker tones can be too heavy. If you don’t want to stick to a color that is strongly masculine or feminine, you have plenty of options. Green is great for use in a learning environment, which makes it ideal for a nursery. It’s energetic and stimulating, but also very calming. Yellow is also a great neutral choice. Its bright and sunny feeling brings a certain warmth to a room and it’s also said to help with concentration. Just make sure you stick to softer yellows if you’re going to paint all the walls yellow—a yellow that is too bright might agitate an infant. 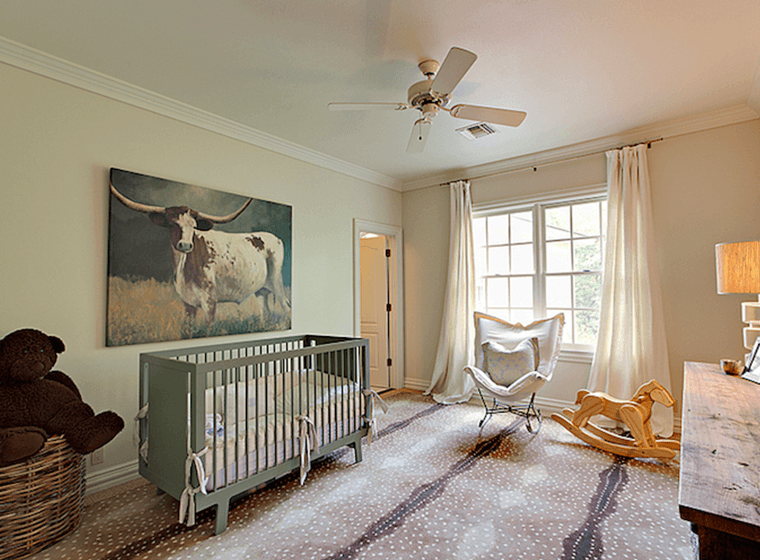 Brown is also a great gender-neutral color for a nursery. It’s a very warm color and can create a truly cozy space. Just be careful with your choice of shade. Stick to rich chocolate tones or much lighter shades, paired with soft neutrals. If you like the idea of brown, but want something a little cooler, gray is a great option. Again, just be careful with the type of gray you choose. Stick to lighter colors and try to pair it with brighter pops of color to prevent it from feeling too dark. Of course, there’s always white! White is a perfect choice for a nursery. It’s pure and simple, and creates a clean backdrop for accents of any color. 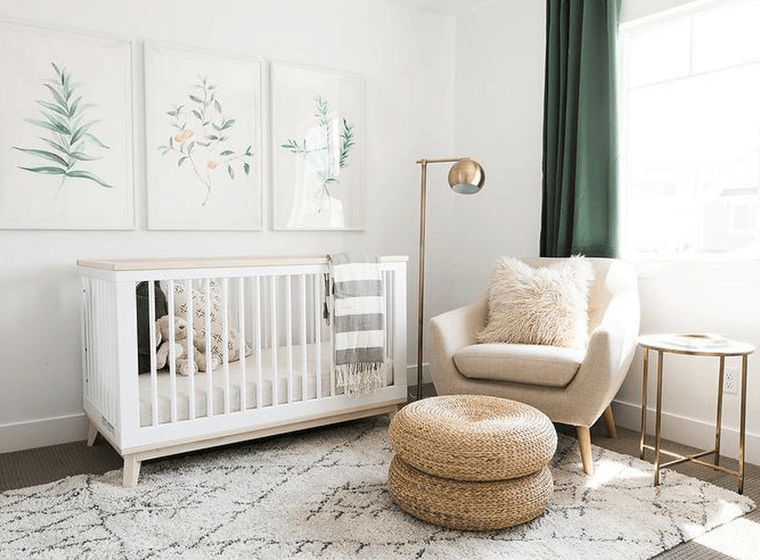 Going with a white color scheme in your nursery gives you some design freedom, since you can easily change up the look by swapping out your accent pieces.